It’s no surprise that Coastal Kitchen in Dana Point was noted as one of the top restaurants to open in OC in 2016. Owners, Michael and Christina Grant are both longtime Hillstone Restaurant Group veterans, and now with their own place, they put much thought into the design, ambience and the food is amazing. 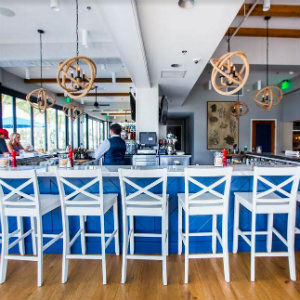 It opened last June in in the Lantern District in Dana Point at one of the city’s most historical sites—in a commercial building from 1924. We love the floor to ceiling windows, the expansive wrap around bar, and modern and clean Nautical design. ​The new executive chef Andrew Palma is creating delicious dishes—starters, signature salads, sandwiches, seafood and steaks--including our favorite hearty Cioppino, filled with pan-seared scallops, ​sautéed shrimp, jumbo lump blue claw crab, manila clams, PEI mussels, grilled Batard bread, topped with fresh herbs; and Jumbo Lump Crab Cakes, filled jumbo jump blue claw crab meat, lightly breaded and pan crisped. Served on a white wine mustard sauce and coleslaw. 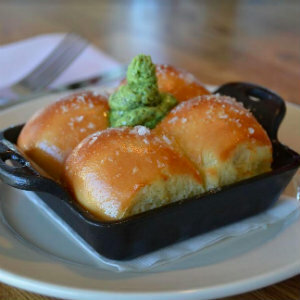 I don’t think you can find a better Heirloom Tomato salad in OC, and you have to start with the dreamy Parker House Rolls, served with warm brown butter and herbs. The hearty shortribs with roasted brussels and slaw were perfect and you must save room for dessert—Coastal Kitchen’s take on S’mores, this one is a pie with chocolate custard, marshmallow meringue and graham cracker crust was delicious. You can enjoy happy hour specials from 5 to 6 p.m. Monday-Thursday; and from 3-6 p.m. Friday and Friday, with drinks starting at $5 and small bites starting at $4. Open 5 to 9 p.m. Monday through Thursday; 11:30 a.m. to 10 p.m. Friday through Saturday; and 11:30 a.m. to 9 p.m.